If somebody was to ask you what was the most significant moment in the entire history of humanity- which one would you choose? The discovery of electricity? The rise of religions? How about the invention of writing? Or, going even further back, the birth of spoken language itself? There is, in fact, a development more significant than any of these. It probably happened sometime between four and five million years ago and occurred within the primate family called the Great Apes. This transformative evolutionary adaptation originated in a species, ancestral to modern humans, who did simply this: it learned to walk on its own two feet. The two biggest physiological differences between man and his closest genetic cousins, chimpanzees and bonobos, are that humans have bigger brains (roughly four times larger) and that humans walk on two feet, whereas chimps and bonobos have stayed on all fours. The decision to swivel on to two feet is one of the most significant evolutionary milestones in what it means to be human. For a long time its impact was masked by a notorious scientific hoax. Piltdown Man was a collection of human skull fragments found near a village in Sussex, England between 1908 and 1915. These bones, it was claimed, dated back at least twenty million years. For decades they were seen by some as proof that man was not after all descended from apes but belonged to its own separate evolutionary line. More important to others was the idea that fossils found in Edwardian England showed clearly that imperial Britannia led the way in human progress. After forty years of acceptance by most of the scientific community. Piltdown Man was finally revealed as a forgery in 1953 thanks to the research of Oxford anatomist Joseph Wiener. He showed conclusively that these bones were nothing more than the merged remains of a modern human and ape skull. The Piltdown perpetrators have never been revealed. But the debacle, even after its exposure, left the lasting impression that in human evolution large brains evolved before the ability to walk upright. As a result it was thought that humans began to walk upright owing to their large capacity for mental thought. They did it because; they deduced that it was a good idea. However, recent fossil discoveries of the bones of bipedal apes have now provided incontrovertible proof that walking on two feet evolved long before big brains. Australopithecus, an ape like creature that pioneered bipedalism, had a brain about the same size as that of a modern chimpanzee (about 400 millilitres). Therefore, it is far more likely that the innovation of learning to walk upright itself contributed towards the development of larger brains rather than vice versa. Australopithecus lived in Africa between about 4.5 and 2.5 million years ago and, since its bones were first discovered by Raymond Dart in 1924, a wide range of skulls, skeletons and even footprints have been unearthed by palaeontologists. The most famous is a 40 per cent complete skeleton nicknamed Lucy, painstakingly uncovered in Ethiopia in 1974 by a team of palaeontologists led by American anthropologist Donald Johanson. The shape of the feet, pelvis and spine of this 3.2 million year old Australopithecus shows beyond all reasonable doubt that her kind walked upright. Volcanic footprints found in Kenya at Laetoli were most likely made by the same, or similar, species about 500,000 years before. An overview of the Piltdown Man discovery and how it was uncovered as a hoax. An overview of an interesting theory relating to human origins. This theory is based around the idea that we acquired most of our strange characteristics through living a semi aquatic lifestyle early on in our history. An overview of the squat feeding hypothesis for the origins of bipedalism orignally proposed by Jonathan Kingdon. This book explores the possibility that chimps and gorillas actually evolved from more human like ancestors, such as Australopithecus. While they reverted back towards looking like typical apes, we took unusual traits like bipedalism to the extreme. Why Stand Upright In The First Place? Why swivel on to two feet in the first place? Unfortunately, there is still no scientific agreement on that critical point. There are a number of competing theories. Clearly, there are certain advantages to a life on two feet, rather than four. Stretching up for food that would otherwise be out of reach is one. 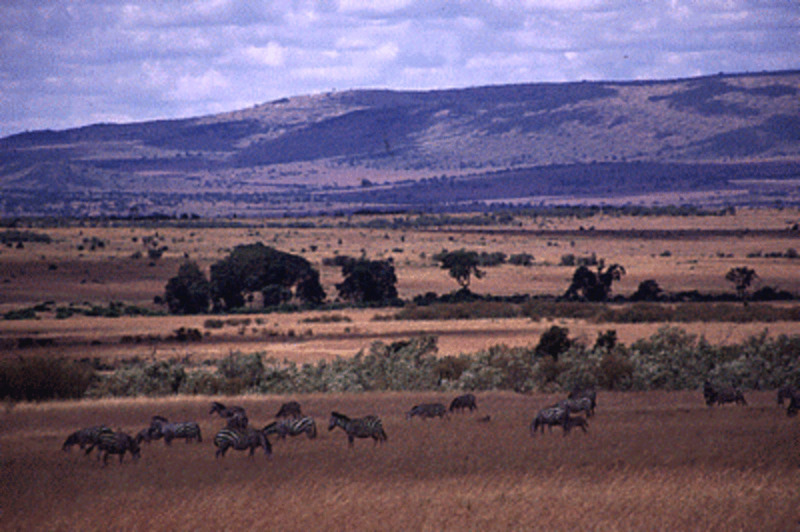 Looking out for danger in grassland areas where there are no trees is another. Wading through rivers is a third, since it is easier to ford deeper water by walking upright than on all fours. Others think that the gorilla like ancestors of Australopithecus rose on to two feet, Tarzan-like, to ward off predators. It has even been suggested that their two footed antics could have been some sort of mating display by males who wished to impress females with the size of their manhood , while females rose up to protect their private parts from rearward attack. Some think walking on two feet began as a fashion- something ‘cool’ designed to impress females (or perhaps pioneered by females to impress males) that then caught on. Once some of the advantages of living on two legs rather than four kicked in, natural selection in favour of those with the best attributes for walking upright took over. By freeing their arms and hands from the task of walking they could then be used for other purposes such as fetching and carrying food for storage to help him survive severe weather conditions. When wading across streams their hands could grip rocks and trees for safety. Hands not designed for walking could become more dexterous and be deployed for making tools such as clubs and spears to kill fish and other animals for food. Walking upright is therefore an evolutionary magic bullet, an adaptation that had a most profound impact on the planet, life and people. Its pioneering species was Australopithecus. Until recently it was thought that hand tools originated with the descendants of Australopithecus, a species called Homo habilis. Traditionally these species are classified as the first true hominids because their brains, at around 650 millilitres, were significantly larger than those of either modern chimpanzees or ancient Australopithecus. But in 1996 a research team led by Ethiopian palaeontologist Berhane Asfaw and American Tim White discovered primitive stone tools dating back 2.6 million years scattered next to the remains of a previously unknown Australopithecus species. 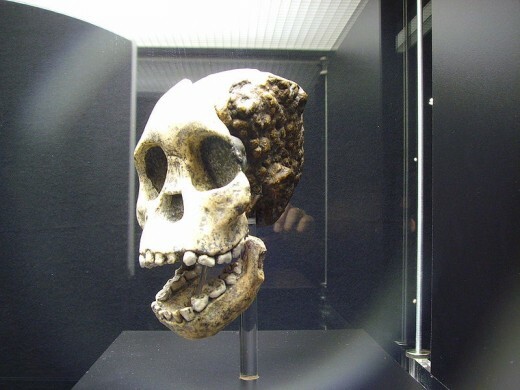 They named it Australopithecus garhi, meaning ‘surprise’ in the local Ethiopian language. The find suggests that Australopithecus gained major survival advantages as a result of walking upright and freeing its hands to make tools. What extraordinary evolutionary consequences lay in wait from this single adaptation! Like two legged dinosaurs hundreds of millions of years before, these bipedal mammals were soon well placed to dominate life on land. But, unlike the dinosaurs they did it not by brute strength, but by using their hands and with what was to follow, much larger brains. By about 2.5 million years ago various species of Australopithecus, some slender omnivores, others more solidly built vegetarians, gave way to descendants such as Homo habilis, whose increasing skill at crafting tools made a vital contribution towards the evolution of more advanced hand eye coordination, better problem solving abilities and, ultimately, larger brains. Throwing weapons they had fashioned allowed them to hunt at a distance without endangering their own lives, ensuring that the genetic impetus of their two legged lineage, pioneered by Lucy and her ilk, powered ever on. Are Creationists Right? Are Evolutionists Right? ... YES! Evolution theory doesn't make sense. I know, that's why it fascinates me so much. Thanks for popping by. 6 years ago from Orange County, CA. great hub on human evolution definitely insightful and makes me wonder and think how it all use to be when mankind first roamed on planet earth luv this stuff, thank you kenny. Really nice hub. Interesting information on how we may have evolved. Voted up. I know Beth! I get the same buzz too. I love the fact that nothing is set in stone. Each new discovery has the potential to destroy an old paradigm and establish a new one. Thanks for stopping by. Loved reading this!! I have been following this since I was young and every time a new discovery is made, or a new theory is introduced, I can't help but be mesmerized while my brain goes into high gear of thinking!! Yep, can't help but agree Leslie. You can look at it in two ways, firstly standing upright paved the way for our ancestors brains to grow. But on the other hand, an extremely intelligent creature is in fact one of the most dangerous you could ever come across. Thanks for stopping by. It certainly was SkeetyD, considering that they were probably already capable of using tools in the same way that chimps do today. Thanks for stopping by. I agree Kris, now we know that Neanderthal DNA survives in modern non African humans, suggesting that we interbred with them. Kind of startling when you think about it. Thank you very much DDE. Bonobos? Bipedalism? Rearward attacks? Me loves to learn - ooga, ooga! Very interesting to think that standing upright allowed mankind to develop a larger brain and not vice versa..
personally - not sure that standing upright and becoming the 'dominant' force on the planet was a good thing - or a bad..
Look where it's gotten us, eh? Truly an awesome hub - amazing facts and figures! Very impressive, James.. Excellent hub. I appreciate that you included the scientific names of the species. I never thought much about the human species evolving to walk on two legs, but after reading this hub, I do think it was a major achievement that set the world's stage. A nicely written hub. Anthropology was always one of my favorite side subject in college. The advances in ancient DNA recovery and sequencing have really helped this field along! Truly amazing you have written a well researched hub I am quite impressed by this topic voted up!! Thank you very much Floris. Appreciate it. No problem Daisy. Thank you very much for stopping by. Great article. Thanks for the update on the theories about upright walking. It has been a ;long time since I have read anything about it. I like reading articles in which I learn something new. I enjoyed reading your Hub very much. Thanks for publishing another well-researched, well-written article. Yes, I don't think necessarily bigger brains, but some kind of change in the brain. After all, we are not using all of our brains, they say. No problem Nate. Thanks for dropping by. Although I doubt whether our brains could actually grow any bigger, after all childbirth is painful enough as it is. Any future development in the brain will probably come as a result of genetic engineering. Very fascinating that bipedalism preceded a larger brain; the implications are interesting, seems to indicate that our brains can be developed even further; this is what I'm gathering from the implications. It is also intriguing what bipedalism allowed for, the better use of hands, and how this created more brain power and technology. The theories on why our ancestors started walking upright are also quite fascinating. Thanks for sharing. Thank you midget, indeed it did. Appreciate you taking the time to pass it on. Informative, James. Walking upright did make things flexible for our primate relatives and for us today. Thanks for sharing, and I pass this on. No problem ShyeAnne. I appreciate you taking the time to stop by and comment. Thank you. A good and informative read, Thank you.